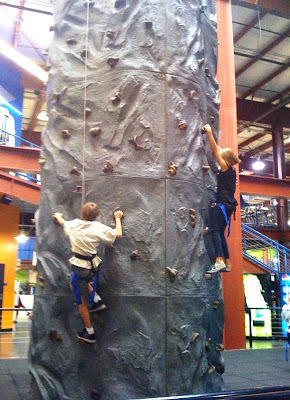 I watched my kids as they climbed the rock wall. Even my daughter, who tends to be a little cautious, descended upside down, laughing. They raced each other to the top, over and over. They didn’t worry about falling. And when they got to the bottom, they stayed there only a second before they grabbed onto the wall and started climbing again. Better them than me, I thought. If I were the one climbing, I’d be worrying if the harness was secure or thinking about how far I’d have to fall if I lost my footing. Does being a parent do that to us–take away our sense of adventure and replace it with caution? We’ve got to prevent them from choking. And keep them from getting hurt. And make sure they don’t talk to strangers. And teach them to look both ways before crossing the street. My poor son can’t even hold his pocket knife without me standing next to him, guarding over him. And I have to bite my lip every time my daughter roller blades down the driveway, just to keep myself from telling her for the umpteenth time to be careful. When I read One Month to Live by Kerry and Chris Shook, and when I did My One Month here on my blog, I became really intentional about seizing the moment and living each day to the fullest. Sometimes, in the daily grind of motherhood, I get side-tracked and lose my enthusiasm. Sometimes I doubt myself and hold back on things. Sometimes I worry and forget to pray. Sometimes I sweat the small stuff. 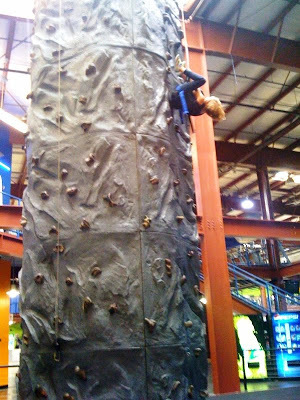 And as I sat there watching my son and daughter on that rock wall, I was inspired all over again. Because I want to approach life with the same enthusiasm they climbed that wall with. I want to face opportunities and challenges with fearlessness and faith. I don’t want to waste time looking down or worrying about falling. And if I do fall, I want to remember to laugh, resting at the bottom for only a minute until I get back up and start climbing again. Being a mom (or dad) doesn’t mean we have to lose our sense of adventure. It doesn’t mean we have to give up our dreams either. It just means we have more people to share our dreams with. I don’t want to miss what’s on the other side of the street in my life because I’m too busy looking both ways to make sure it’s safe enough to cross. And I don’t want to miss the view from the top of the rock wall, either. Well now you have to tell us, did you climb up on the rock wall? Love this post! What great encouragement to pursue my dreams.Thanks for hosting Mom Monday…I'm finally jumping in and participating for the first time. Yup. I get cautious when I forget Who actually keeps my children safe, Who knows the number of their days and Who loves them more than I do which seems so impossible.When I remember that, then I can live in the day and enjoy life at a depth fear wont let me. Thanks so much for sharing, everyone!And Emily, no, I didn't climb the wall. I was speaking symbolically…lol! I've learned to let go of a lot…mommying four boys will do that to you! When I remember that God is in control, it is easier for me to ease up a little bit…but I still worry, I just do it less! Your post spoke to my heart- such a great reminder. And…I want pics of you descending that wall…upside down. Being overly cautious kills…your dreams and even relationships that is-a slow, grueling death. After all, it's fear we're talking about here. Fear is the opposite of faith. I fight this one every day too. I would love to climb some rocks! I, too sometimes forget about our One Month to Live adventure and just last week as we were in the bank my lil man wanted to go Playtown (in the same shopping area) and I really wanted to go home and relax… After saying no I decided to just do what he wanted to do and I am so glad because he had a blast and I got to catch up on emails and blogging on my laptop. I love when I am forced to remember to be a little more spontaneous.